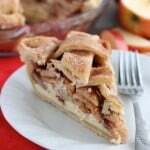 Apple Pie Recipe - Dessert Now, Dinner Later! 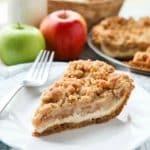 This homemade apple pie recipe has a flaky pie crust with cinnamon-sugar sprinkled on top and an extra fruity apple pie filling with just the right amount of sauce. 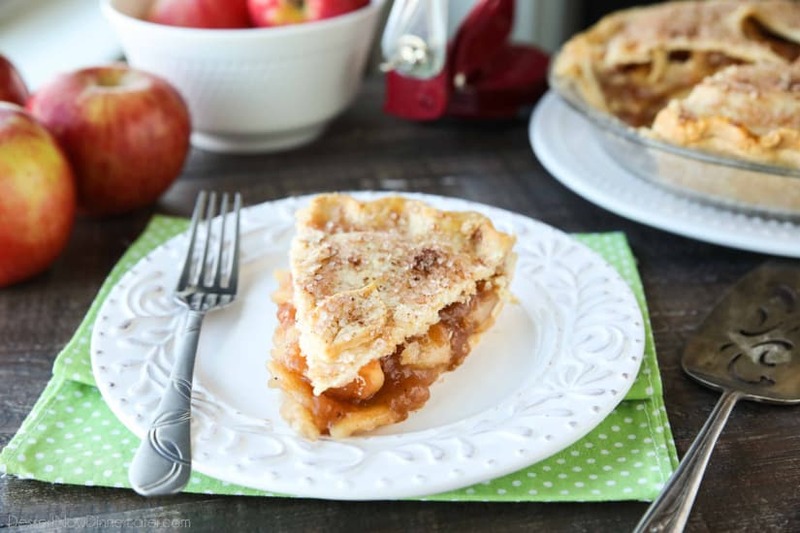 Apple pie is an American classic. It’s simple, satisfying, and a Thanksgiving must have! 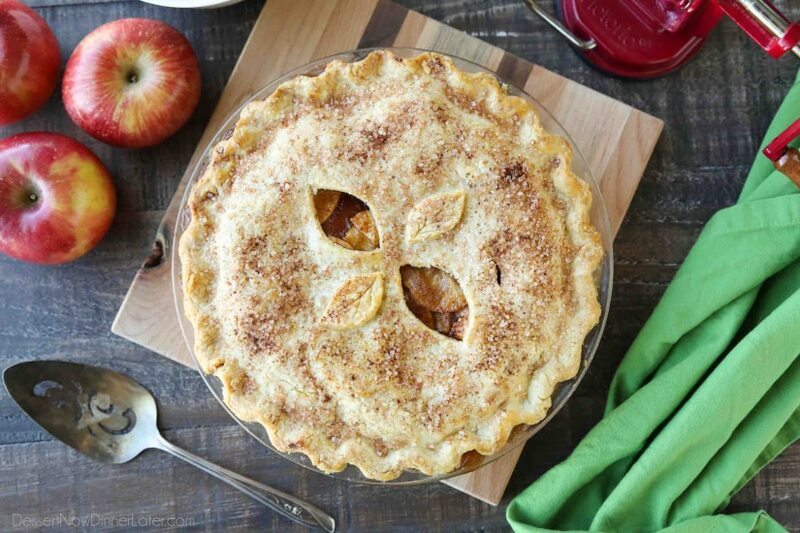 With a flaky tender crust, and a sweet apple-cinnamon filling, it’s easy to see why this is the most popular pie. There are two ways to make apple pie. Either by simultaneously cooking the filling while cooking the pie, or par-cooking the filling and finishing it off while cooking the pie. The choice depends on the desired amount of sauce and cook on the apples. I prefer a little more sauce and a softer apple, so I prefer to pre-cook my apple pie filling before baking my pie. Which is what I did for this apple pie recipe. The apple pie filling I used in culinary school is tasty and goes straight into the pie shell (no pre-cooking required), but it’s big on fruit and little on sauce. The choice is up to you, which is the beauty of homemade recipes. The best apples for apple pie are tart, and semi-sweet. Granny Apple or Jonagold are top picks, but you can literally use any apple and adjust the sugar based on the sweetness of the apple. I typically buy what’s on sale and use those. (Except don’t use red delicious apples. Those will turn to mush and aren’t very tasty to begin with.) Feel free to combine a couple of different apples for a unique flavor combination. 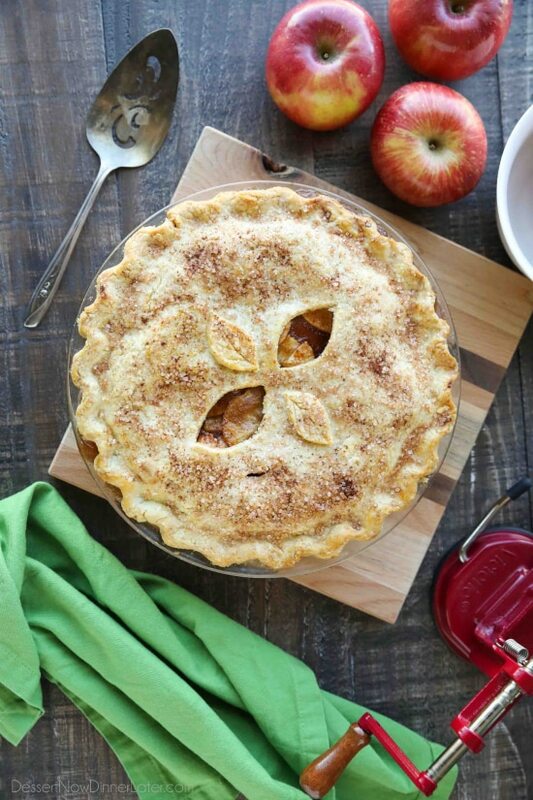 After you’ve got the apple pie filling ready to go, all you need is the perfect pie crust for the top and bottom. You can make a lattice top, or cover the apple pie filling completely. Just be sure to cut slits for ventilation if you do. 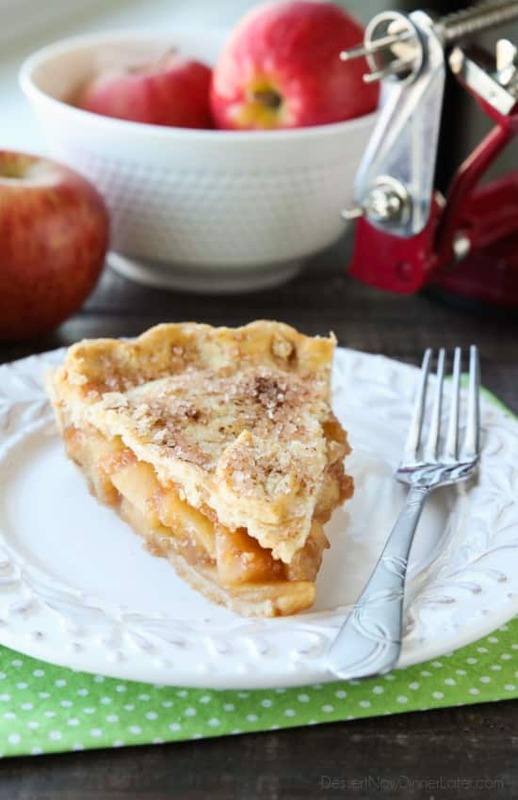 I like to sprinkle the top of my apple pie with cinnamon and sugar. 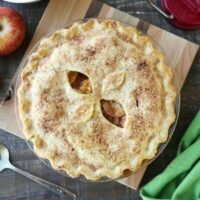 You can use coarse or granulated sugar, but it makes it pretty and adds an extra layer of flavor and texture to this delicious apple pie recipe. Enjoy! Cool the apple pie filling to at least room temperature before using for the pie. Once the dough has chilled, remove one piece at a time. Flour your surface and rolling pin. Roll dough from the center outwards, rotating and adding extra flour as needed until 1/8-inch thin. Carefully transfer the dough to the standard 9-inch pie dish. Shape the crust to the bottom and sides of the pie dish. Trim excess crust. 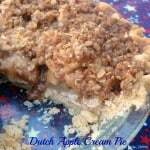 Fill the pie shell with the cooled apple pie filling. Roll out the second half of the pie dough for the top. (Cut out designs if desired [i.e. leaves] and set aside.) Lightly brush the edges of the bottom pie crust with a whisked egg (egg wash). Lay the top pie crust over the apples. Trim, seal, and crimp the edges. Cut slits in the top of the pie crust (if you didn't cut out any designs). Brush the top and edges of the crust with egg wash. (Attach the designs now, if desired.) Combine 1 tsp of cinnamon and 2 Tbsp granulated/coarse sugar. Sprinkle generously over the pie crust. Bake in a preheated 350 degrees Fahrenheit oven for 1 hour + until the filling is bubbling in the center and the crust has browned. If crust browns before filling bubbles, cover the pie with foil and continue baking. Cool pie to room temperature before slicing and serving. *For very soft apples, only mix 1/4 cup of the water with the cornstarch to make a slurry/paste. Set aside. Simmer apples, covered, with the remaining water until desired tenderness. Then add the cornstarch slurry and heat to boiling to thicken the sauce. 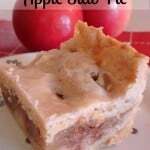 *For a raw/no-cook filling, use the apple pie filling in this recipe.